Automatically viewing images from specific people in your Thunderbird address book is fine. But, don’t add your own email address(es) into your address book and check that box. 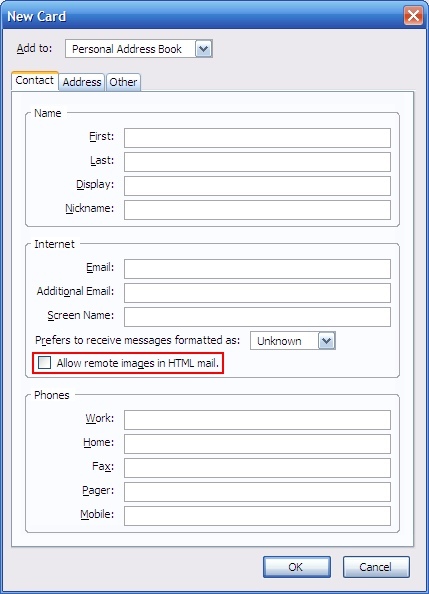 If a spammer ever gets your email address, and you open that email, images displayed inside the email will verify you. I lasted about a year in minimizing spam. It’s starting to trickle now, but I hope it doesn’t get any worse. For further information, read “Privacy basics [for] Thunderbird” at mozillaZine. I know about Gmail. They appear to have the best spam filters[1. Compared to the other free webmail providers]. If you’re not paranoid about Google seeing everything, they’re the way to go. Do you have your own domain but want Gmail hosting? Look at Google Apps.